I found a version of this prompt in a set of questions written by a social worker for parents in open adoptions. As always, feel free to adapt it to your personal situation; if you grew up in an open adoption, you could look back on your actual experience. One note: I deliberately avoided asking you to imagine how your grown child feels about their open adoption experience. Adoptees of all ages regularly report having more than enough people (i.e. any) telling them how they should feel about adoption. This is an exercise in thinking about our actions and choices from another's perspective. Cindy (first mom): "I have learned many adopted persons who do not know the basics of their first parents struggle with the answers to things like "why are your eyes so blue" and such. I hope that at least my son will be able to answer such simple cursity with confidence. Even if that's the only thing that this open adoption gives him." Elly (adoptive mom): "I hope he will look blankly at people who ask him when he was told he was adopted, or if he wants to search for his birthparents. I hope it’ll just be as straightforward as knowing he’s a boy, or that he has brown eyes." 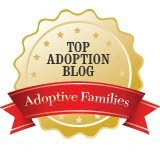 A (adoptive mom) at A+A Adopt a Baby: "The gossamer threads that join me to her are not at risk simply because she is also connected in deep and important ways to other people. In fact, one of my primary responsibilities is to open up in her the capacity to build those connections to others, the capacity to both know and own herself and to share that self with other people. I hope that when J describes her experience growing up as our adopted daughter she is able to say that she was encouraged to both find herself and connect that self to her whole family, that despite everything that may be working against her she was raised to truly belong to herself and in the world." Sonya (adoptive mom) @ The Dobbins Boys: "As I write this, we have just come back from dropping our 8 year old off to spend the weekend with his biological great-grandparents, great aunt, and bio cousin. Yes, we got 'Do what???!!' from a couple of friends and family. The thing is, I don't want him to see a distinction between us and his bio family, I just want it to simply be 'Family'. I hope that the adult Silas (and Stephen) will see that we did not let fear or jealousy or whatever keep us from fully embracing all members of our extended family, by blood or adoption"
KatjaMichelle (first mom) @ Therapy Is Expensive: "I hope Kidlet will be able to say I am present, available... I hope he will see me as family and not think twice about including me in his future life... I hope that my actions show my belief that even though you can’t choose relatives you can choose family; and his parents and his brother to be a part of who I consider my family." Susiebook (first mom) @ Endure for a Night: "One of the only things stopping me from cancelling the upcoming visit is not wanting Cricket to look back and see broken promises from the birthparents. If he can say that we were always around when wanted, it will have been worth it. I hope he’ll say that we were what he wanted us to be." Heather (adoptive mom) @ Production, Not Reproduction: "But I could decide the kind of person I wanted to be in the middle of it all. It's an image that shifts and adjusts as I learn more about myself and my family. But it's been quite empowering at times to focus on what I do have a say over (myself) instead of fretting about what is outside my control." Crista (pre-adoptive mom) @ Our Very Own Star Stuff: "I want our children to look back and see that we encouraged them to freely communicate with their birthparents and that we were able to visit them and other birth relatives when possible. Having a sense of family history has been important to me, and I want them to have access to whichever of those stories interest them." Jess (adoptive mom) @ The Problem With Hope: "I want her to know that my opinion of her first mom is very high. Her other mother is amazing and strong. Knowing her has changed my life for the better. I want her to know that we are like any other family....thrown together perhaps because of twists of fate, but in the end, there for each other through good and bad because we love each other." Rredhead (adoptive mom) @ Adoption.com: "Third, I’m glad that, even though you are my real parents, I still know S. I know I had a hard time understanding why she kept my brother and sister but not me. I think I get that now, but I have to admit, it still hurts sometimes." Michelle (adoptive mom) @ The Four Gardners and Me: "I hope she knows I enjoyed it -- I get to brag about her to the only other people in the world who love her as much as I do. I hope she knows that the openness was as much for me, as for her and her mother. I couldn't live with her adoption any other way." My name is Andy (adoptive mom) @ Today's the Day! : "I hope that Liam will recognize that we tried. That we had his interests at heart and that we wanted to do what we could for him. That even though we couldn't force his mom to have an open adoption with him that we kept the door open for her. " 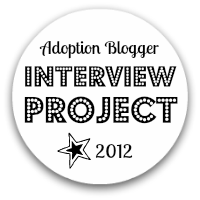 Lavender Luz (adoptive mom) @ Weebles Wobblog: "Also, I appreciate that you let me talk about adoption stuff when I wanted to, but didn’t bring it up all the time. Even though you wrote about it ALL.THE.TIME." Spyderkl (adoptive mom) @ Evil Mommy: "Will she forgive any of us for what we did, what we meant to do? To have her know that she was never unwanted – that she was wanted and loved by so many, some she knows well, some she may never meet? I hope she can." Debbie (adoptive mom) @ Always and Forever Family: "I hope Isabel will say that I was a good mom. That I loved her enough to let her make her own decisions but cared enough to keep her from the bad ones. I do not expect her to thank me for adopting her, nor do I expect her to thank me or appreciate the sacrifice that it was for me in the beginning to have an open adoption with her birth family. I would love for her to understand the reasons why we did it." Mama C (adoptive mom) @ Mama C and the Boys: "If I wanted to back off from my relationship with my birth family, I did. Mom would pick up the slack if it was necessary. Then when they became more important, and even more present in my life at times then even she was, we talked about that too. She said that her hope was to create a net under me that didn’t have any real big holes, or weak spots in it when I was ready to leap." I might actually be the first commenter!! shocking!! I don't really blog right now so I am going to go ahead and leave my 'thoughts' here. I actually imagine what my son would say about being in an open adoption often. I have imaginary conversations with what I imagine as a 'grown-up' version of my son. Being that I am not as involved in my son life as I wish I was, being that his adoptive parents have decided that me being a part their 'real' life is inappropriate for the simple reason that my prescence would bring attention to the fact that they adopted. and I guess they're OK. They gave my some nice stuff for my birthday. My mom and dad say that I have to visit with them, so I do." I hope that my son can be very articulate and vocal and be able to tell anyone he knows all about the basics of who I am and who his first father is. I have learned many adopted persons who do not know the basics of their first parents struggle with the answers to things like "why are your eyes so blue" and such. I hope that at least my son will be able to answer such simple cursity with confidence. Even if that's the only thing that this open adoption gives him. I don't really know how to 'support' the relationship my son has with his adoptive parents, other to respect their parenting decisions and such. Just as I do with other family member, like my sister. I hope he will look blankly at people who ask him when he was told he was adopted, or if he wants to search for his birthparents. I hope it’ll just be as straightforward as knowing he’s a boy, or that he has brown eyes. I hope he’ll say he doesn’t need to search because he knows M’s phone number, email address, or is her friend on Facebook. I hope he’ll take it for granted that he has four parents. I hope he’ll think we respect and care about M (his birthmom), empathise with her decision not to parent him, and the appreciate the consequences of that decision for her. I hope he’ll feel able to attribute his unique mix of talents, interests, quirks and habits to us or his birthfamilies without feeling that he is betraying either. I hope that he will have been able to ask without fear if he wanted to contact M, and that we treated his request with the same respect that we would if he asked to call any other family member, and help him fulfil that request. Likewise, if he wanted to try and trace his birthfather I hope he’ll feel that we helped him as much as was appropriate for his age. Realistically, though, we are his parents. We’ll have certain beliefs about what is appropriate for him at certain ages. Maybe sometimes those won’t mesh with what he thinks he is capable of (isn’t that virtually guaranteed in growing up?!). I suppose, in the end, I hope that integrity, honest and sensitivity will have seen us through. Just finished mine, it's my first time to participate! 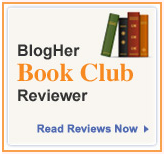 @Ginger - I couldn't find your post over at your blog. :( let me know if you decide to repost it! My thoughts on the matter, from a foster care adoption situation. Really made me think on this one. Took me a place I'd never been. I don't get to say that often enough!